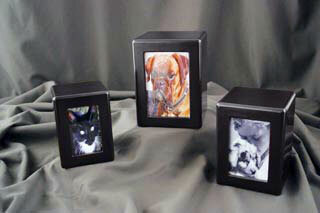 At Head for the Hills Pet Crematorium we offer mass and private cremations as well we have a wide range of urns. The Ceramic Urn is available in black or spiced cream. It can be personalized with a gold or silver chain and a name plate. Name plates come in the following shapes: round, heart, dog bone or your pet's tag. It is offered in four sizes small, medium, large and x-large. 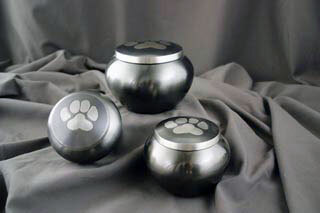 The Odyssey Urn is available with a double gold paw print or with a single pewter paw print. It is offered in three sizes small, medium and large. 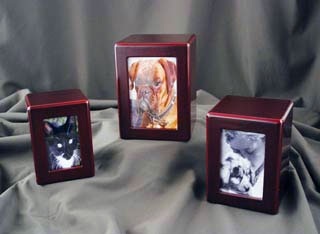 The Photo Box Urn is available in birch, black, and cherry. It is offered in three sizes small, medium, and large. 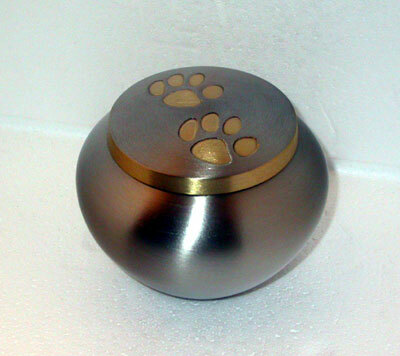 The Paw Print Urn Necklace will hold a small portion of ashes that can be kept with you at all times either in your vehicle, at work or at home.